Action: The Montana Heritage Commission has decided to suspend steam train service for 2010 and will launch a private fundraising effort to bring back service. Background: The steam locomotive was brought to Virginia City in 1998 as a trade with the Escanaba Railroad in Michigan for several train cars in Nevada City. The steam train has been operated by both volunteers and staff, and requires operators to have a "boiler traction license" with the state of Montana (Dept. of Labor and Industry). The Department of Labor annually inspects all boilers in Montana and is requiring an ultrasound inspection and maintenance of the inner workings of the boiler. MHC has estimated the cost for this inspection and maintenance at $130,000 to $160,000, just to certify the boiler. 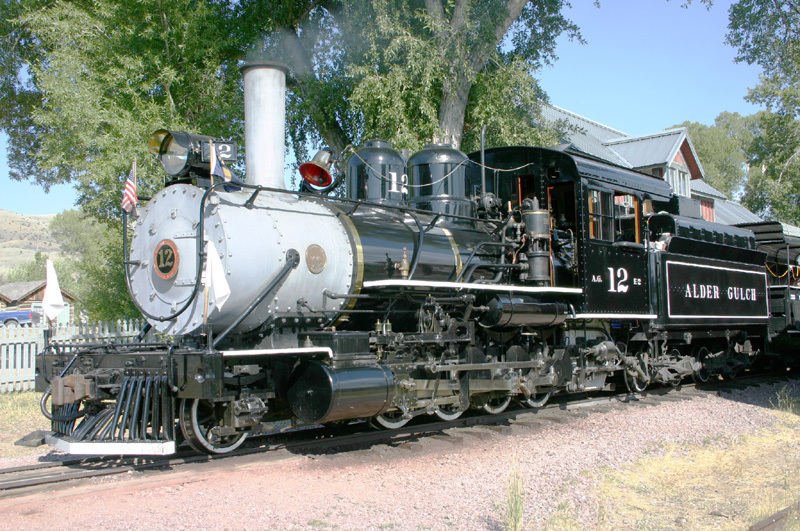 Fundraising: The Montana History Foundation (a private 501-c-3) has created a fund for the Alder Gulch Railroad and Steam Train. As the fiscal agent they ensure funds are used solely for this designated Montana Heritage Commission purpose and donor's intent. Gifts are tax deductible. A secure website is available for donations at the link below. Goal: Our goal is to raise $300,000 for the maintenance and operation of the steam train and railroad. The first goal is to raise enough funds to complete the maintenance required, and seek an on-going maintenance reserve for the long term needs of the railroad and steam train. Timeline: Once funds are raised the train will likely be sent via truck to Moorhead MN to have the overhaul on the boiler performed and the engine returned upon completion of the work. MHC would then seek Federal Railroad Administration (FRA) certification for all our train operations. The estimated time needed for the maintenance and inspection is 4-5 months. Once the overhaul is performed and FRA certification is obtained, the engine will be able to operate for 15 years before another overhaul is required. The Montana Heritage Commission announced on April 18, 2011 that neither the steam nor the gasoline-powered train will be operating for the foreseeable future. More information is available at www.virginiacitymt.com. Please make your contribution through the Montana History Foundation today!